Unbeknownst to many, gum disease is a progressive infection that is formed in the gums and can result in severe consequences if left untreated. Gum disease, which is also known as periodontal disease, causes the dental tissue to become inflamed. If neglected, gum disease can become severe and actually affect the root of the tooth, causing tooth loss. So what does progressive gum disease look like and how can you identify it? Let’s break it down. There are three stages to gum disease. They range from mild to severe according to the severity of the infection. These three stages are known as gingivitis, periodontitis, and advanced periodontitis. Gingivitis is known as the first stage of gum disease and is also the mildest form of the infection. Compared to the more severe stages of gum disease, gingivitis is the least destructive because it doesn’t damage the bone. Immediate treatment can reverse the infection and allow for a full and speedy recovery. Symptoms of gingivitis include tender, sore, red, and bleeding gums. Other implications that you may be suffering from gingivitis include the occasional bad breath from plaque buildup along the gums and formed spaces in between the gums and teeth. These spaces form as a result of damage inflicted on the periodontal fibers which are known to attach the gums to the teeth. 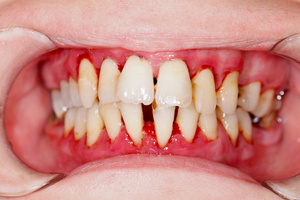 The second stage of gum disease is periodontitis. This stage occurs when gingivitis is not treated in time and progresses. As a result, instead of having plaque buildup along the gumline, it is found beneath the gumline, requiring more intensive treatment to get rid of it. Just like with gingivitis, tender, red, sore, and bleeding gums are present but the occasional bad breath is now permanent. With periodontitis, the disease is more advanced meaning that the damage to the bone is now possible. This occurs as a result of the formation of periodontal pockets which pull away from the teeth and create a hub for infection. The unhealthy gums then allow the teeth to become unstable and loosen up. However, there is time to reverse the damage caused by periodontitis if the infection is addressed immediately. Advanced periodontitis is the final and third stage of gum disease. It is also the most severe, causing tooth decay and tooth loss. Advanced periodontitis is the point of no return, the damage is irreversible with symptoms including swelling around the root of the tooth, a faulty bite, and pus seeping from the gums. The severity of this stage means that the periodontal pockets have now grown in size, deepening and creating more room for festering bacteria to thrive. This bacteria, therefore, causes great damage to the bone and results in tooth loss and decay. If you’re in need of a dental cleaning or think you may have gum disease, contact Dr. Hoffman in Lincoln, NE for a consultation. Here at Family and Implant Dentistry, our professional dentist and staff strive to help patients maintain a healthy smile all year round. Call us today to schedule a consultation!